English recording & mastering engineer and musician. Born in March 1960. 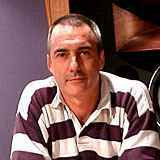 Began his career as a recording engineer at Wave Studios, London, in 1983. Started his mastering and lacquer cutting career 1990 at CTS Studios. Then joined Alchemy Soho/ Alchemy Mastering in Spring 2000 and worked there until 2010. Still mastering as a freelancer but also pursues a career as musician.